Maybe we should have expected that just like the movies, the second series of the Iron Man slots would be coming. And Playtech, the providers of Marvel comics’ themed slots did not disappoint. They brought the Iron Man 2 slots that have some extra features, and perhaps, some downgrade from the first version. Worry not, the downgrade isn’t anything that would discourage you from the game we hope. Iron Man 2 makes part of the Slots by Playtech that have a jackpot that progresses. The Iron Man 2 Slot Machine has 5 reels and a fixed 25 paylines. There are versions with 50 paylines. 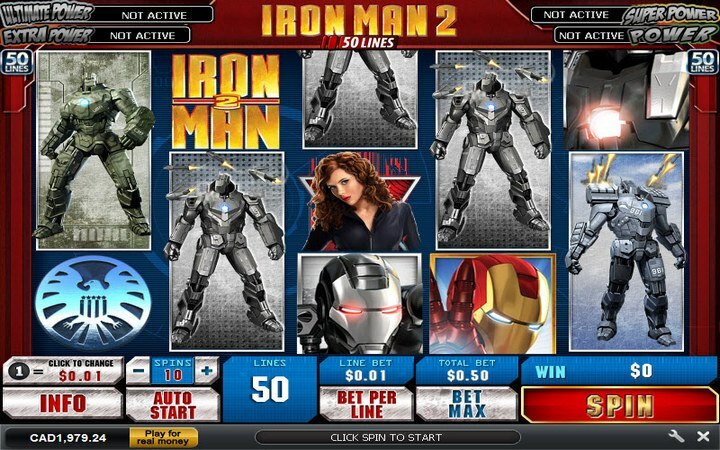 The game is available online, and you can play Iron Man 2 Slots for free before you decide on whether you would like to put real money on it. The game is available on desktops, but you can only access it via Adobe Flash Player. Unfortunately, the game is not available on mobile, and so you will have to do with the desktop and laptop versions. The graphics and sound of this game are next level amazing which is not a surprise because Playtech is known for great quality. The Iron Man 2 slots game includes symbols picked from the movie. There’s team bad guys that include Ivan Vanko and his allies, and the good team is made up of Iron Man, War machines, Tony Stark, and Black Widow who is the gorgeous Scarlett Johansson. You would probably want to play with the good team because their payouts are more. The payouts are from 150x to the high payers like Tony Stark with 1000x and American Eagle emblem with a payout of 3000x. The first two spins increase your earnings twice. The third and fourth spins increase your earnings three times. The fifth and sixth spins increase your earnings four times. The seventh and eighth spins increase your earnings five times. Spins nine and ten increase your earnings six times. To play this game, you need a minimum of €0.5 per spin for the 50 payline game and €0.25 for the 25 payline version. To win the huge amounts would require that you play with higher amounts. You stand an opportunity at the €30,000 jackpot with a bet of €250. Play Iron Man 2 Casino for amazing thrills and wins. The game stays very true to the Marvel movie, and the objective remains to stop Ivan Vanko from destroying the planet. It is important to note, however, that the Marvel Slots have been pulled off online casinos and you may not get an opportunity to enjoy the hero slots again.